Second Term Presidents: Obama's Legacy | Jenkins Research Inc.
American’s are finalizing their decision on who will become the next President but it is worth considering what this election means for Obama. Can he achieve a second term and what does it mean if he does not? Incumbents have an inherent advantage when it comes to re-election and Presidents have a fairly high success rate in achieving re-election for a second term. Since 1968, there have been 6 opportunities for a President to be elected for two consecutive terms. In four of those, the incumbent was successful. Carter (1980) and George H.W. Bush (1992) were the exceptions. Unpacking why some are successful and others are not is clearly not possible in a statistical sense given all of the possible reasons why Americans might re-elect an incumbent but history has its lessons. What, then, can other recent cases tell us about the task that Obama has set for himself in getting re-elected. Perhaps it is worth considering the previous cases of success and failure. Notably, all four successful incumbents improved their share of the popular vote and their share of the votes cast in the Electoral College. It was a bigger win the second time around for the re-elected incumbents. Each of the cases has a story but some part of that story may be that when faced with a reasonably successful incumbent, the opposition party simply does not put up the strongest possible contender. If Obama manages to win, he may do so by bucking the trend by winning with less public support in his 2nd election than he did in his first. He may then have even less political capital in his second term. How is this outcome (or even losing) possible? Carter and Bush (Senior) certainly had their issues but what is Obama’s problem? Is it the continued economic uncertainty? While the economy has improved since 2008 it clearly remains challenging for many Americans. Is it failed promises? Perhaps. A strong opponent? Seems unlikely, even if Romney has surprised some people. Unrealistic expectation? Probably. A look at Presidential Approval indicates that Obama has struggled throughout his presidency. Obama has an approval rating in the high 60s when he was about to take office but by August 2009 (less than a year into his Presidency), his approval rating was hovering near 50%. Eventually, it would fall to a low around 38% in August of 2011. 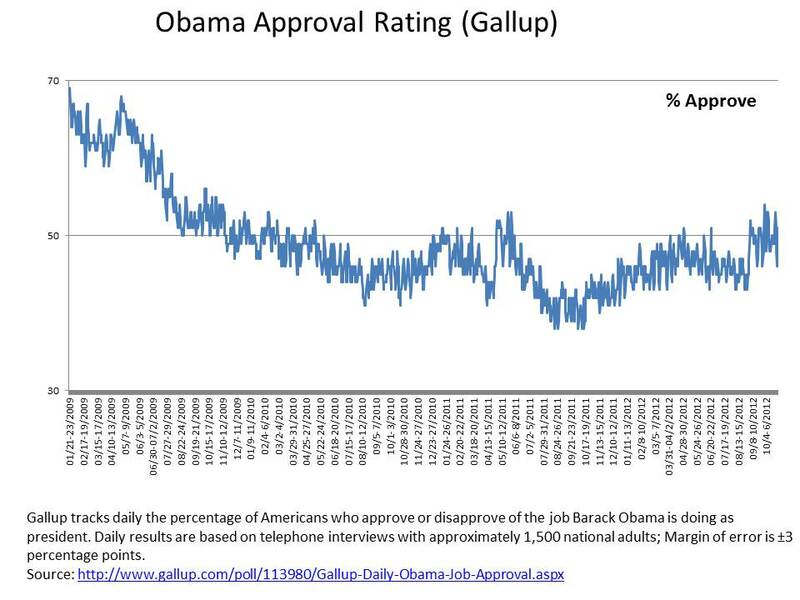 While Obama has returned to an approval rating of around 50%, he is clearly divisive. Obama became President in the midst of economic gloom riding a message of hope when faith in the political class was clearly more shaken than ever before. He does not wear the economic failure of either Bush Presidents (Sr. in 1992 or Jr. in 2008 when he left) but his Presidency, like the American economy has stalled. As the first African American to hold the office of the President, Obama’s legacy is, perhaps, secured in history. If he loses this election, we may wonder what else will be written about him. If Obama-care does not survive under a Republican administration, what else do we hang on this President? It seems like he had the title of two-term President locked up but his incumbent advantage may have been more illusory than real. Perceived Republican weakness rather than strong support for Obama may have driven this expectation. Losing now to a vulnerable and, perhaps even weak, contender will tarnish his accomplishments further. 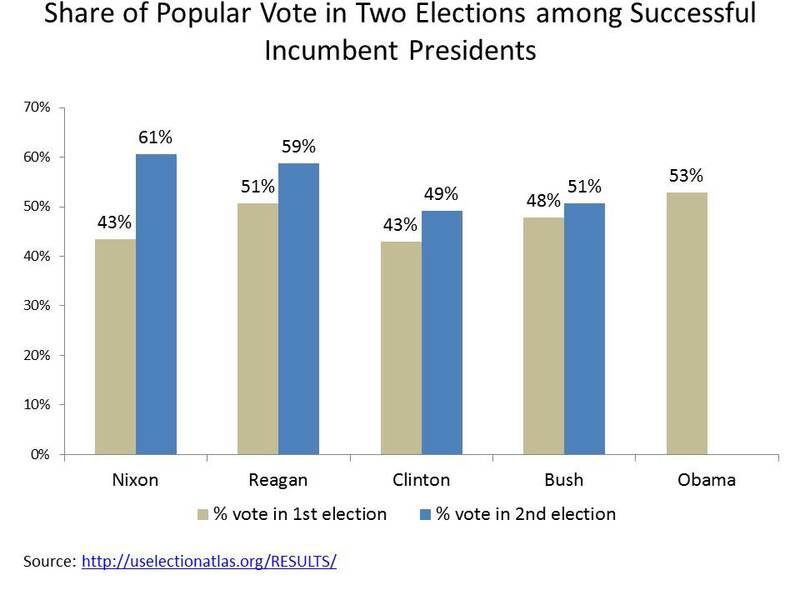 Fairly or not, Presidents are expected to win twice.